It doesn't take long for jewelry to get tangled. I swear even though I have them separated in my jewelry box they still get tangled. Hubby and I had to downsize to a small apartment and there was not the room for many of the things I had such as my tall and bulky jewelry box which many people have. I wanted a different way to find the earrings or chains I wanted right away and easy to put away. I started at the dollar store and found those little plastic boxes designed to hold screws and other small items and used those for my earrings to keep them paired off, but after a while I simply had too many and no room for a dresser. 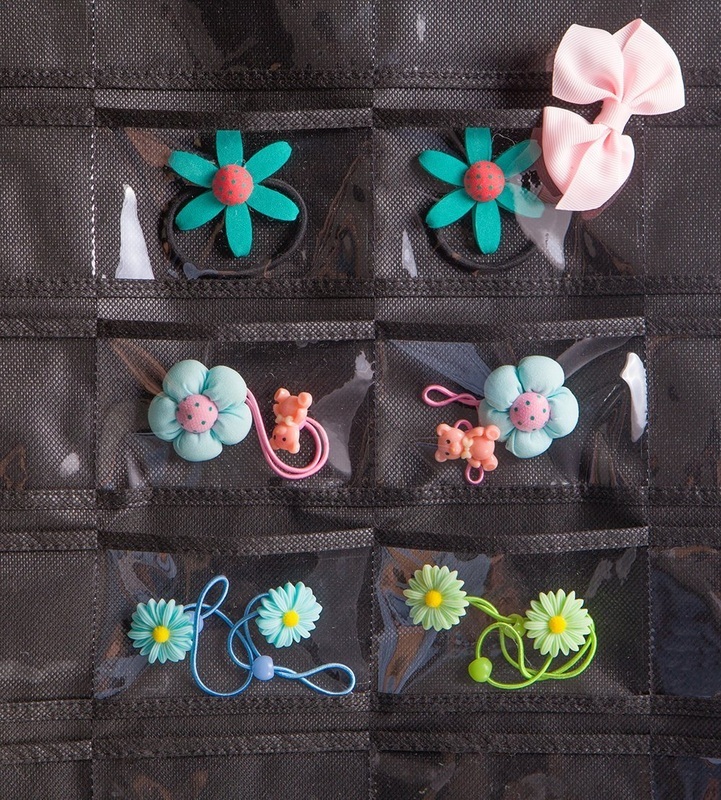 Keep this in mind though as an option if you only have a few pieces, they work well for stud earrings and are only a buck!. I then checked out other ideas, and after finding all kinds of awesome ways to organize my room and closet, I decided I could still utilize the space in my closet for my jewelry. 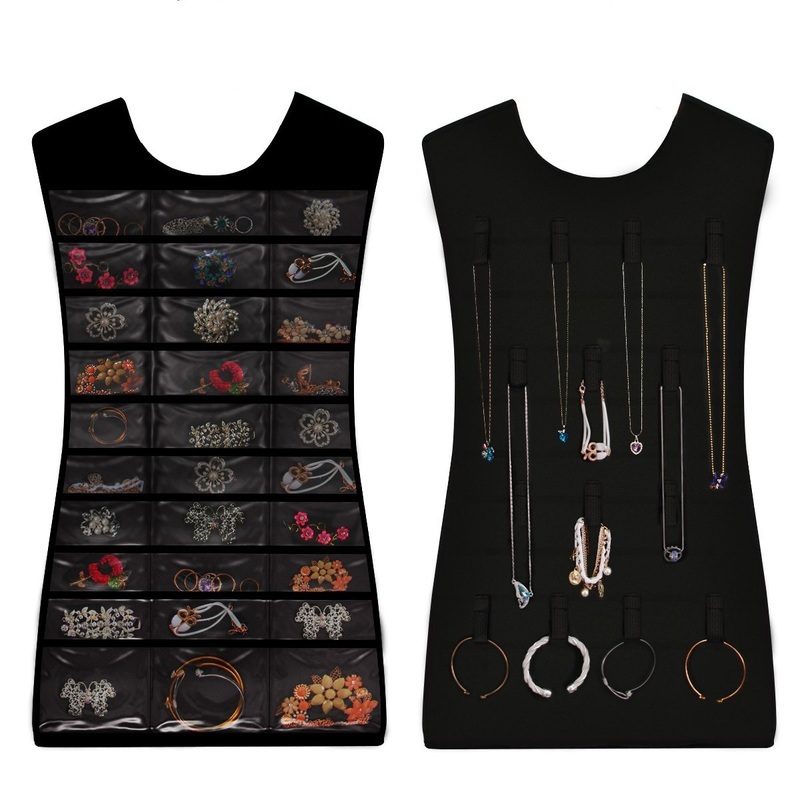 I was renting so didn't want to damage walls, but found these hanging pockets that will totally separate your pieces, and since you stand at the closet to pick out your outfit I figured my jewelry might as well be there too! Below are some affordable options that hold lots of pieces. 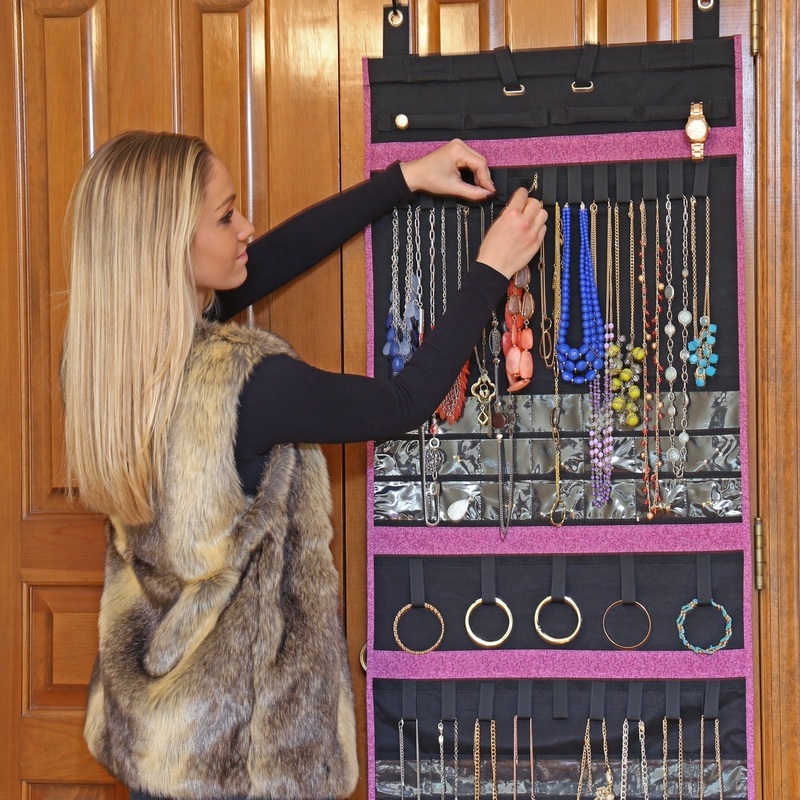 Hanging Jewelry Organizer - Can Live in Your Closet! I thought this one was really awesome especially if you travel and like to take all your jewelry with you instead of picking and choosing. This particular one fits over the door, so you can keep it on the inside of your closet door, but next time you take that trip, you simply roll it up and off you go. 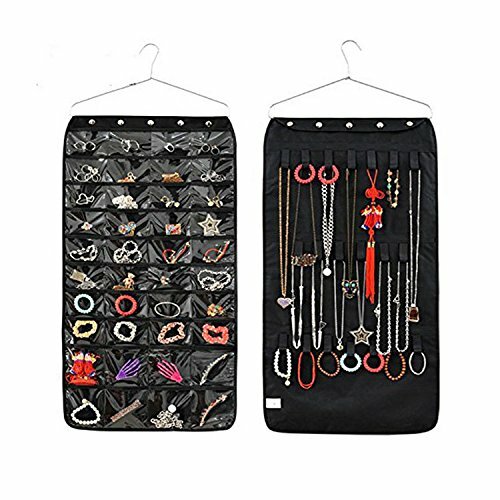 If you want something a bit more serious that a flexible fabric style hanging jewelry organizer, then this was one I came across in my research. You could hang this on the back of the bathroom door or your closet or bedroom door. 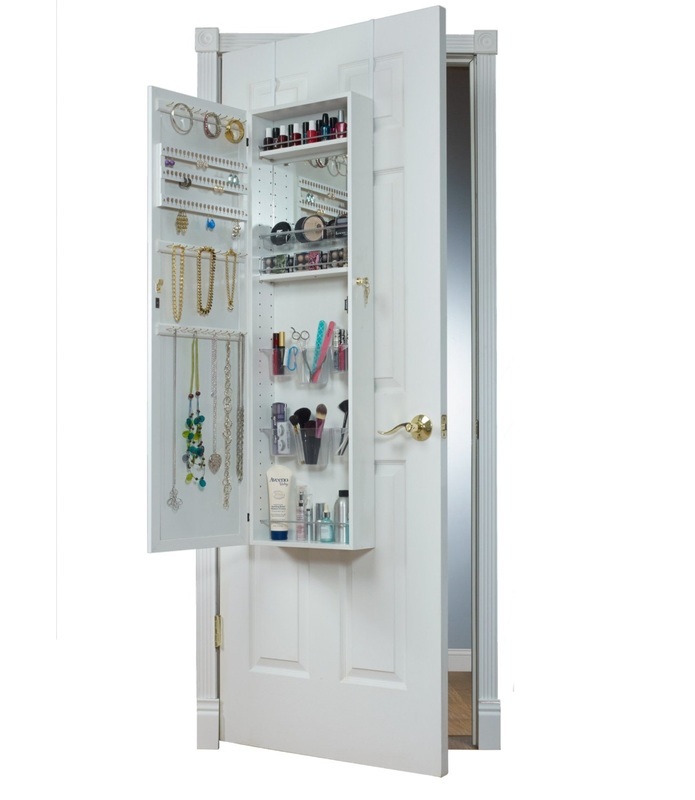 It has a mirror on the front and is actually a cabinet that can house not only your jewelry but your cosmetics too. Pick out your earrings and necklaces as well as put on your makeup. It is not permanently installed it simply fits over the door so no holes to drill or installation. If you are looking for something more than just storage, this one has everything without taking up space. Think of the bathroom space you will save! I actually love this one! What Type of Pieces Do You Have? If you have lots of earrings such as I do, then those pockets are great for being able to see the pieces I want right away, if chains are more your thing, then pick one with more room for chains rather than pockets. There are so many affordable options now for storing your things. You just have to figure out your clothing, jewelry, and makeup personality and get the right accessories that work for you! Once you have your clothes and accessories organized in your bedroom, then you can work on the jewelry. If you have room for a dresser it can be nice to have the surface clear of clutter and jewelry. 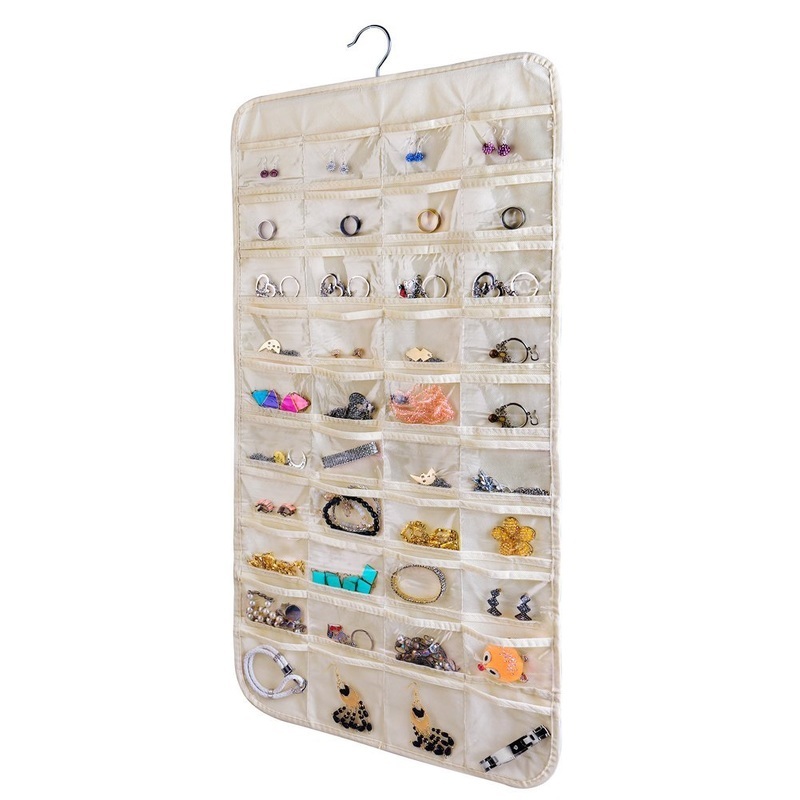 I always found jewelry got dusty on my dresser, and I wasn't the best at putting it away in my jewelry box, so these hanging jewelry organizers work best for me. I know this page was about hanging jewelry organizers you can put in your closet, but thought I would include this idea as well. 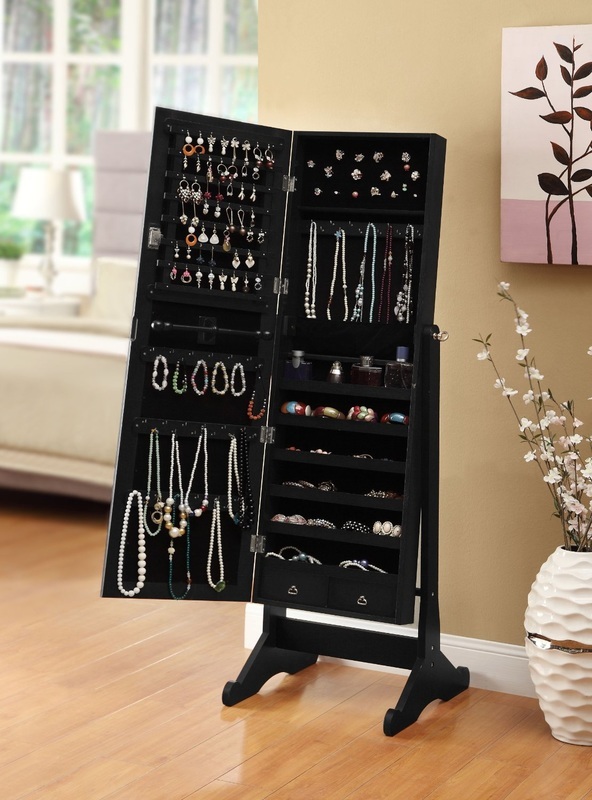 If you simply don't like the idea of your expensive jewelry hanging in a closet with pockets, you can get these free standing beautiful mirror that actually opens to be a hidden jewelry cabinet. This keeps it out of view and it doesn't look like a cabinet. It simply looks like a free standing mirror any bedroom might have. I thought this also was a cool idea if you have the floor space. You have your mirror to check yourself out and then all your jewelry pieces inside on shelves, hooks and even little drawers. Everything can fit in here and no one would know it was there. Organizing your room and closet can sometimes mean freeing up room for treats such as this one. Just to give you some more ideas! If you are more of a DIY craft person, then you could also turn picture frames into hanging jewelry organizers. This can actually make your jewelry look like pieces of art. Most apartment landlords will let you hang pictures, so this might be another cool option especially for your chains, especially if you don't have a closet! Second hand stores usually have many old frames for cheap, you can keep them the same or change them like this girl did in the video.